I have decided that I will be shaming some not-so-serious business people. The first one I will write about is a lady whose snacks I saw posted on Soko Kuu on Facebook. She had photos of the snacks – samosas, spring rolls and mahamris – she had cooked and they looked really great. Snacks that were advertised on Soko Kuu…. Since I was supposed to host Bible Study the next week, I decided to give her a try and save myself the hustle of cooking after work for my BS group. After some Facebook back and forth with the lady, she confirmed that the samosas on the photos are some that she cooked on that very day. And that if she was to prepare some, they would look exactly like what they did in the photo. And she supplies various offices with the snacks – she named the offices where she delivers the snacks. 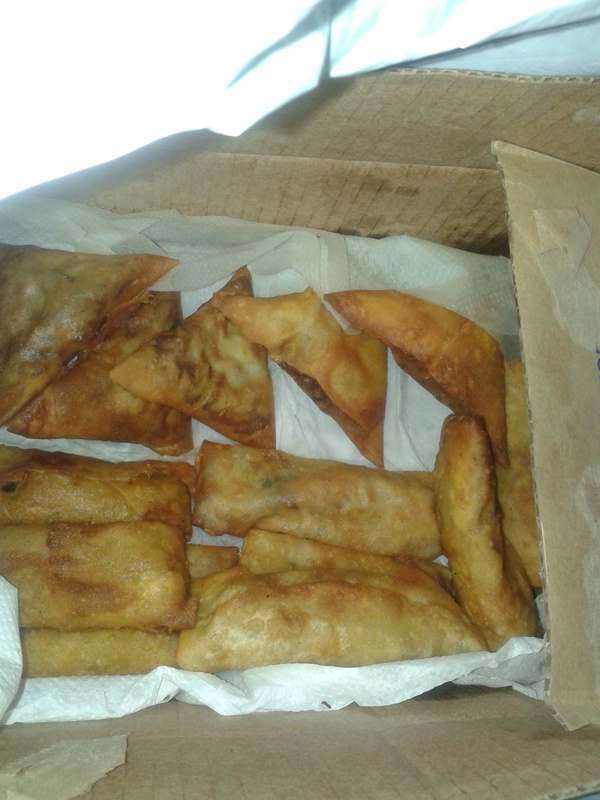 I requested for sample samosas, spring rolls and mahamris to be delivered to my office the next day at 12pm. She confirmed that this was in order, especially since she only had morning deliveries for that day. Her minimum order size was 10 of everything which I thought was too much given I just wanted to sample her goods. All the same, I gave her instructions to my office and she requested for a 50% down payment. Which I promptly sent. The next day at 12.30pm, I remembered that I was to receive a delivery at mid day. I called her and she said that she was running late but she should be at my office in 30 minutes. Mo was having spring rolls for lunch and she agreed to give me one which I would replace as soon as the lady arrived. No, we have already made your snacks. I am on the way, please send me directions. Breathe in Njenva, I told myself and sent her the directions. At 4.15pm, she calls and asks whether she should take the lift or the stairs to my office. Do I really care whether she flew or crawled up? No. Take your pick. Was I really surprised that she delivered the snacks 4 hours later and managed to hold 4 different conversations with me without saying the word ‘Sorry‘ or even making an attempt to apologize for the horrible service provided. At least the snacks were here. I wish I had saved the image of the promised snacks because when Mo and I opened the packaging, the below is what we found. Samosas and spring rolls in a random carton lined with serviettes. The mahamris were in a black polythene bag. 4. Soko Kuu might not be the best place to scout for serious business people.